Tanabe, Katsumi. 2018. Not the Queen Šābuhrduxtag but the goddess Anāhitā: Identification of the female figure in the investiture scene of Narseh at Naqsh-i Rustam. Japan Society for Hellnistic-Islam Archaeological Studies 25. 9–26. The rock-cut relief depicting the investiture scene of the Sasanian King of Kings, Narseh (293-302) at Naqsh-i Rustam in southern Iran has been investigated by many scholars since the beginning of the twentieth century CE . As regards the iconography of this relief, one of a few problems that have not yet gained scholarly consensus is the identification of the female figure depicted on the viewer’s rightmost side of the relief. Currently there are two major hypotheses as regards the identification. One of them is to identify the female figure as the Zoroastrian goddess of water, Anāhitā (Arədvī Sūrā Anāhitā). The other is to identify it as the queen of Narseh, Šābuhrduxtag (Shāpuhrdukhtak). Kassam, Zayn R., Yudit Kornberg Greenberg & Jehan Bagli (eds.). 2018. Islam, Judaism and Zoroastrianism (Encyclopedia of Indian Religions 15157). New York, NY: Springer. The earlier volume in this series dealt with two religions of Indian origin, namely, Buddhism and Jainism. The Indian religious scene, however, is characterized by not only religions which originated in India but also by religions which entered India from outside India and made their home here. Thus religious life in India has been enlivened throughout its history by the presence of religions of foreign origin on its soil almost from the very time they came into existence. This volume covers three such religions—Zoraoastrianism, Judaism, and Islam . In the case of Zoraostianism, even its very beginnings are intertwined with India, as Zoroastrianism reformed a preexisting religion which had strong links to the Vedic heritage of India. This relationship took on a new dimension when a Zoroastrian community, fearing persecution in Persia after its Arab conquest, sought shelter in western India and ultimately went on to produce India’s pioneering nationalist in the figure of Dadabhai Naoroji ( 1825-1917), also known as the Grand Old Man of India. Jews found refuge in south India after the destruction of the Temple by the Romans in 70 C.E. and have remained a part of the Indian religious scene since then, some even returning to Israel after it was founded in 1948. Islam arrived in Kerala as soon as it was founded and one of the earliest mosques in the history of Islam is found in India. Islam differs from the previously mentioned religions inasmuch as it went on to gain political hegemony over parts of the country for considerable periods of time, which meant that its impact on the religious life of the subcontinent has been greater compared to the other religions. It has also meant that Islam has existed in a religiously plural environment in India for a longer period than elsewhere in the world so that not only has Islam left a mark on India, India has also left its mark on it. Indeed all the three religions covered in this volume share this dual feature, that they have profoundly influenced Indian religious life and have also in turn been profoundly influenced by their presence in India. Seyed Mousavi, Atefeh. 2018. Narrative Illustration on Qajar Tilework in Shiraz (Beiträge zur Kulturgeschichte des Islamischen Orients). 2 vols. Dortmund: Verlag für Orientkunde. Tilework illustration of the Qajar period has received comparatively little scholarly consideration. This applies specifically to Shiraz, where the art was abundantly practiced. My book, the first of its kind, presents a detailed analytical study of Qajar tile painting in Shiraz. The material has been collected during two extensive fieldwork trips. Having collected more than 5,000 photos, I have chosen 42 historical buildings in Shiraz with tile work decoration for a detailed analysis, supplying minute descriptions for each and every image together with a solid documentation of the tiles’ respective location in the buildings. My study identifies, classifies and analyzes the depicted themes and the craftsmanship behind it. Particular attention has been devoted to a detailed discussion of the prominent themes, their argument and motivation, as well as to popular artists of the period. In addition to the study, my work contains ample visual documentation. Hintze, Almut, Desmond Durkin-Meisterernst & Claudius Naumann (eds.). 2019. A thousand judgements: Festschrift for Maria Macuch. Wiesbaden: Harrassowitz Verlag. This volume in honour of Maria Macuch brings together twenty-six articles by friends and colleagues to celebrate the academic work of the foremost living expert of Sasanian law. The subjects covered here include Iranian linguistics and philology, Judeo-Persian, Zoroastrian law and religion, Manichaeism, and the Babylonian Talmud. They reflect the breadth of the work of Maria Macuch. 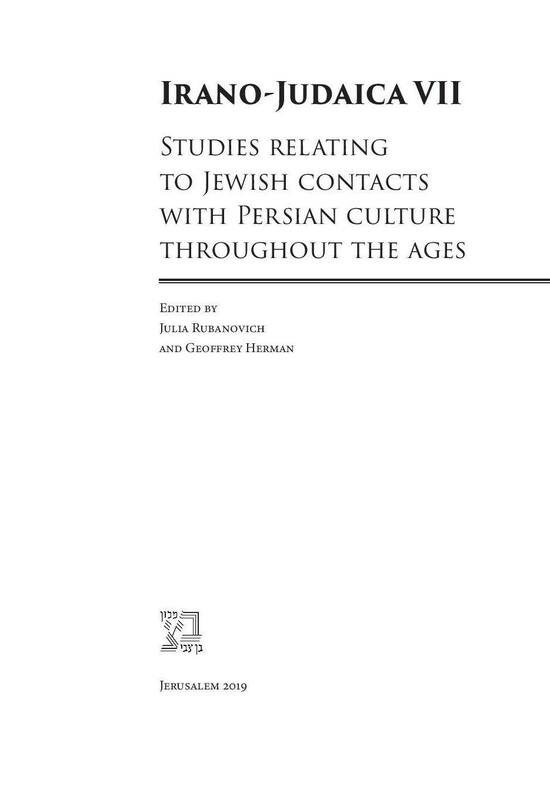 The volume includes studies of important Iranian legal, grammatical and religious terms and titles, of the intercultural engagement between Zoroastrians, Manichaeans and Jews, and editions and studies of texts and text fragments in Pahlavi, Sogdian, Khotanese and Judeo-Persian languages. The book will be of special interest to legal, cultural and religious historians as well as to philologists and linguists. Kellens, Jean. 2018. Becoming Zarathustra. In Hugh B. Urban & Greg Johnson (eds. ), Irreverence and the sacred: Critical studies in the history of religions, 185–193. New York: Oxford University Press. This chapter examines the role of ritual and sacrifice in the most sacred Zoroastrian literature, the Gâthâs in order to explore the complex relationship between the figure of Zarathustra and the human ritual officiant. The chapter presents a very Lincoln-ian sort of history of the field of Zoroastrian studies itself, interrogating the contexts and biases of particular scholars in their various readings and misreadings of the tradition. At the same time, it offers a new way of thinking about the figure of Zarathustra himself, who is best understood not as the semi-historical “founder” of Zoroastrianism but rather as the mythical personality into which the human officiant is himself transfigured through the ritual operations. Sadovski, Velizar. 2017. The columns of R̥ta: Indo-Iranian lexicon and phraseology in the ritual poetry of the Avesta, Veda and Beyond. In Ivo Hajnal, Daniel Kölligan & Katharina Zipser (eds. ), Miscellanea Indogermanica: Festschrift für José Luis García Ramón zum 65. Geburtstag (Innsbrucker Beiträge zur Sprachwissenschaft 154), 715–743. Innsbruck: Institut für Sprachen und Literaturen der Universität Innsbruck. The focus of the present article […] is laid on the phraseological and poetical combinatorics of the word for ‘pillar, column’, Ved. sthū́ṇā-, YAv. stū̆nā-, OPers. stūnā-, fem. […], which as a common appellative designates a constructive element of the Vedic and Avestan house (incl. the ‘mobile house’, the [migration] wagon) and functions, as well, as a key metaphor in hymns of house, e.g. in the ceremony of ‘ascending the pillar’ (by the beams) in the ritual of building a new home […]. Both in its everyday usage and in its metaphoric applications in texts of ritual character, the word seems to belong to a common lexical stratum of Indic and Iranian. Stickel, Farida. 2019. Zwischen Chiliasmus und Staatsraeson: Religiöser Wandel unter den Safaviden (Religionsgeschichtliche Versuche und Vorarbeiten 70). Boston, MA: De Gruyter. Die Arbeit geht dem religiösen Wandel in Iran unter den Safaviden nach. Dabei wird nicht die Verkündung der Schia als offizieller Religion 1501 in den Mittelpunkt gestellt. Vielmehr werden die Safaviden kontextualisiert, der religiöse Wandel selbst anhand beteiligter Akteure, Auswirkungen auf religiöse Institutionen und Legitimation von Herrschaft sowie der Übersetzung in Architektur und Performanz von Ritualen nachgezeichnet. Sims-Williams, Nicholas & Bi Bo. 2018. A Sogdian fragment from Niya. In Huaiyu Chen & Xinjiang Rong (eds. ), Great journeys across the Pamir mountains (Brill’s Inner Asian Library 37), 83–104. Leiden: Brill. In 1994, the Sino-Japanese Niya Expedition Team excavated an artifact (93A27F1:3) at Niya. It is a small brown package or pouch made from a piece of paper (originally mistaken for parchment) fastened by a woolen string. Traces of writing were visible, so the artifact was provisionally referred to as “A Kharoṣṭhī text written on parchment” in the preliminary report of its discovery. In 2007, when the Xinjiang Institute of Archaeology’s research group on Niya was editing the third volume of the Report on the Sino-Japanese Joint Expedition in Niya, they carefully examined this “parchment text.” After the string was untied, it was found that the paper had been used to wrap up a powder of vegetable origin, perhaps spices or medicine. When the powder was removed, a text written in black ink in a clear script was visible. Noting that the writing appeared to be the same as that of the Sogdian “Ancient Letters” found near Dunhuang, which were written in the early fourth century, and other Sogdian fragments of similar date found at Loulan, the local archaeologists were able to determine that this new fragment was also written in early Sogdian script. Sadovski, Velizar. 2018. Ritual formulae, structures, and activities in Vedic and Avestan liturgies. Münchener Studien zur Sprachwissenschaft 71/1. 81–134. Die Arbeit präsentiert Untersuchungen zu einer Reihe von Begriffen aus dem Bereich des indoiranischen Kultus bzw. Rituals einerseits in ihrem Kontext innerhalb der vedischen und avestischen Ritualdichtung und -praxis und andererseits vom Standpunkt ihrer mythologischen Relevanz, insbesondere in Bezug auf ihre Rolle für die „Mythopoia“ in den Sakraltexten von Indern und Iraniern. So werden einerseits Personifikationen bzw. Deifikationen derartiger Kultbegriffe geschildert, andererseits verschiedene Mechanismen ihrer Kombinatorik auf syntagmatischer, intra-textueller Ebene (innerhalb des Kontexts eines liturgischen Hymnus/Vorgangs) bzw. auf inter-textueller Ebene, im Rahmen des Hypertexts der aus zahlreichen einzelnen Litaneien bestehenden Ritualhymnen und in den aus ganzen solchen Einzelliturgien bestehenden Ritualkomplexen dargestellt. – Der vorliegende Aufsatz entwickelt dabei die Idee über die fundamentale Rolle von Katalogen, Listen und Enumerationen als poetische, aber auch als mythologische und kosmologische Form: Basierend auf mehreren früheren Studien des Verfassers, die das Funktionieren solcher intertextuell verbundenen Textcorpora in der indoiranischen Ritualdichtung vor allem textlinguistisch, vom formalen, kompositionellen und kognitiven Standpunkt behandeln, gibt nun das Thema „Ritus im Mythos“ die Gelegenheit, die katalogisch aufgebauten Formen von Litaneien und Liturgien in den vedischen Sakraltexten vom RV an (insbesondere in den RV-Khilas und dem Yajurveda) und in der ‚Langen Liturgie‘ des Avesta sowie ihre Bedeutung sowohl zur rituellen „Wieder-Erschaffung des Universums“ mit jedem Kultakt und -text als auch zur Mythologisierung entsprechender Begriffe mit rituellem Inhalt zu untersuchen.